To find and nurture talent, to help careers, to influence inner beauty. This expanding beauty pageant is designed for those wishing to further their career in show business. We look for the walk, look and posture, and must be BEAUTIFUL, TALL, and CO-OPERATIVE as well as confident. Those international models selected, from this heat, and live heats, will come to the world final in 2019 to compete with models from other ex British Empire Countries such as the UK, Australia, Sri Lanka, etc. The last 4 years Australia won, previously England won, and previously Wales won 2x. Last year Sri Lanka won the Ms, and India won the Mr. 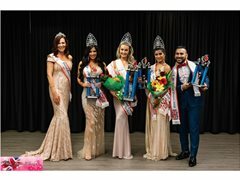 Winner to world final of Miss Tourism Planet 2020. Pre world final heat shows will be held in June in ex British Empire countries such as Australia, Sri Lanka, etc.